Experience three generations “Vincent” - motorcycles at the Swiss-Moto, stand of EGLI Motoradtechnik AG. 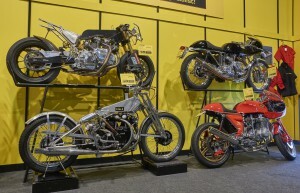 The TPV EGLI-Vincent prototype at the booth of EGLI Motorradrechnik AG, together with an EGLI-Vincent (top right), a Vincent Black Lightning (bottom left) and an EGLI Honda (bottom right). We thank the EGLI Motorradtechnik AG for the opportunity to present the bike in this amazing environment.